These days, we're veterans in the steel beasts. Gazing at the frozen Nordic landscape rushing by, fleeing from whatever nest of whore mongers and turmoil we started in. Playing cards, telling tales of the road to passers by, and drawing sustenance from crude boxes filled to the brim with apple wine. The steam and noise and clank of trains are music to our ears. We're train people now. I'm not currently in possession of the best of internet connections. This weekend, we'll go to Arvika. About a year ago KungMarkus said that the Arvika Festival would soon become the third largest 93/94 event in Sweden, beating gatherings like Warcon, Sehlskapsspelen, Frippan Open, L.I.G.G. and Wexio in awesomeness and attendance. And it looks like they've already done it. 33 players have signed up so far to battle in the small city; a hair's breath from the number of players at last year's national Vintage championships. 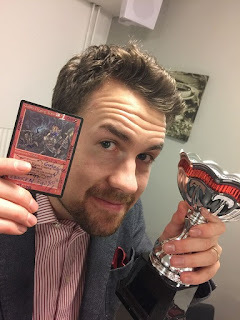 We're looking at six rounds before the top8, and as awesomess goes, the ambience at Arvika last year made it one of my favorite Magic events of 2015. Casual gaming, sweet decks, and lots of cheap beer. 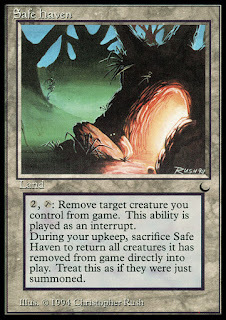 Arvika is a haven for the #mtgunderground in ways few gatherings are. When I started playing, there were a few artists who were as important to the game as the rules themselves. The guys who created the world where we played. Artists like Jesper Myfors, Ron Spencer, Drew Tucker, Anson Maddocks and Dan Fraizer. And of course Christopher Rush. 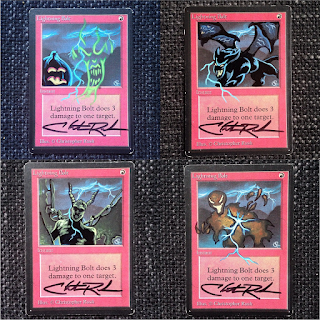 Christopher Rush had a huge part in creating the nostalgic joy we experience when we play old school Magic. Just a few days ago, Kalle and I were talking about contacting him again to get some alters of Rukh Eggs for n00bcon. I never talked to him myself, but from what I heard he was a very friendly and easy-going guy. My personal experience with him was solely from his work, but through that he made a big impact. Magic just got older. I'm sad to hear that one of the original creative minds is gone. His work and the impact he made will be with us as long as there is a Black Lotus in the world. Last weekend Alexander "Talad" Midjich and the L.I.G.G. crew in Stockholm organized their first 93/94 gathering. 20 players showed up to battle with the oldest of cards, and when the dust settled Martin Berlin and Gordon Andersson faced off in the finals. Wasn't it the exact same finals at Nebraska's War in Italy in December btw? Those guys might have something going on. If anyone of you who participated in the event would like to write a short report, I'd be happy to post it here. In lieu of a tournament report, let's check out some tech from the top8 of the tournament.